Former Baltimore Police Department commissioner Darryl De Sousa was sentenced to 10 months in federal prison this morning. 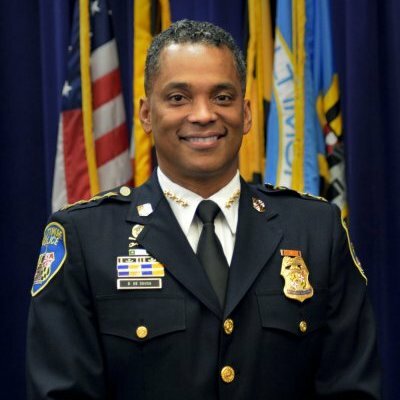 “Simply put, Darryl De Sousa is a tax cheat,” prosecutor Leo Wise said in federal court, ramping up his argument to Judge Catherine Blake for why the former Baltimore City Police commissioner and 30-year BPD veteran should do a full year in prison for not paying his taxes for 2013, 2014, and 2015. De Sousa, who was charged in May 2018 (and soon after resigned as commissioner) and plead guilty in December 2018, performed a maddening dance maintaining that his taxes issues were “a mistake” related to poor judgement rather than anything intentional. But due to De Sousa’s plea deal, we know the totality of De Sousa’s tax cheating was even more egregious than knowingly not paying in 2013, 2014, and 2015. In 1999, he falsely claimed nine allowances and between 2008 and 2012, falsely claimed deductions on expenses he said he was not paid back for, mortgage interest, business and property losses—despite owning no business or property at the time—and made up donations to charity. Wise focused on a tweet De Sousa sent out on May 10, 2018, which misrepresented the nature of the tax issues right after he was charged. “My only explanation is that I failed to sufficiently prioritize my affairs,” the tweet read in part. And De Sousa, Wise argued, was surely smart enough to realize he was misrepresenting himself. “He is not someone that doesn’t understand he doesn’t own a home,” Wise said. Wise and fellow prosecutor Derek Hines also prosecuted the Gun Trace Task Force (GTTF). The attorneys had mentioned that De Sousa’s tax scheme was happening at all levels of BPD, command on down. De Sousa, a commander, and GTTF member Jemell Rayam, who testified on the stand during the GTTF trial at the beginning of 2018 to lying on his taxes in a way that was similar to De Sousa, illustrate this apparently common practice. A transcript of Rayam’s testimony during the GTTF trial is below. He was questioned by Marcus Taylor’s lawyer, Jennifer Wicks. Wicks: In addition, you talked to the Government about some times that you were not truthful on your taxes; correct? Wicks: And, in fact, during this time period where you’re saying you’re making extra money by claiming overtime that you’re not working, you also declared charitable donations that you hadn’t even made; correct? Rayam: Yes. I did cheat on my taxes as well. Wicks: Ok. And in addition, for the withholding for your Maryland and state taxes, you had changed your deductions and exemptions so there would be less money paid in taxes; correct? Wicks: And that’s what you did for several years, 2012, 2013, 2014, 2015; correct? At sentencing it is common for the person facing sentencing to bring up friends and family to give statements of support and to ask the judge for leniency, but De Sousa’s lawyers had those asking for leniency take the stand and be sworn in, as if they were witnesses. The result was a series of leading questions by one of De Sousa’s lawyers, Adam Ruther, facilitating praise for the former commissioner. Darren Sanders, a former Baltimore police detective and current Vice President of Security for the Baltimore Ravens (who was charged with groping a woman in 2014 and later found not guilty) and friend of De Sousa’s, testified to De Sousa’s character. He stressed De Sousa’s devotion to Baltimore, the community, and his parents, both of whom were sick beginning in the early 2000s—his mother with alzheimer’s, his father with Parkinson’s disease. Denise, DeSousa’s eldest sibling, talked about her parents’ illness, and how De Sousa helped the family out, paid for heating oil, and filled the fridge with groceries. DeSousa’s lawyer, Gerard Martin followed up on that and stressed that De Sousa “paid most of the bills” for his family—money it would seem he had more flexibility with because of the tax scam. Martin also dismissed the tweet statement as something written by BPD rather than De Sousa himself. When De Sousa spoke to Judge Blake, he mirrored his May 2018 tweet. Judge Blake focused on the way De Sousa and his lawyers continued to downplay the seriousness and clear intentionality of the tax cheating, recast as just a byproduct of a cop too concerned with the community and child who cared too much for his parents to worry about his taxes rather than someone engaged in an extended plan to not pay his taxes and misrepresent his income. De Sousa’s family gasped loudly when he was sentenced to 10 months. Then Martin told Judge Blake that De Sousa had discussed April 15—tax day—as the day to report to begin his 10 months in federal prison.